I’ve been lucky enough in my career to do a lot of cool things, but spending time with Yogi Berra is at the top of the list. I got to know Yogi well during our tapings of Yogi and a Movie, which ran a few seasons on YES … OK, so some of the movies weren’t the greatest, but the time spent with Yogi was, and still is. 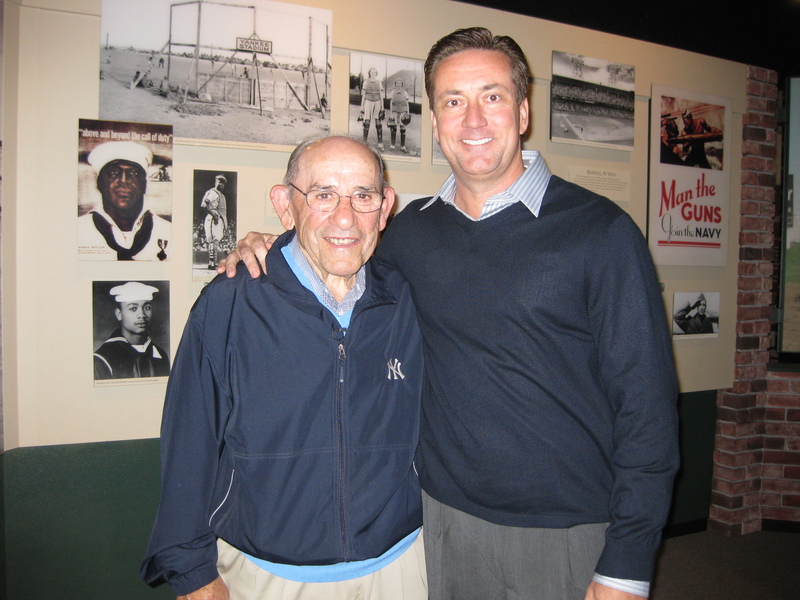 That’s because I spent this morning at his museum in Montclair, N.J., taping an interview about D-Day that will air on the pregame June 6th as we commemorate the 65th anniversary of that pivotal date in history (a whole lot more with Yogi will also be available on the website). As many of you probably know, Yogi, then better known as Lawrence Berra, Seaman Second Class, was a 19-year-old kid in the Navy who volunteered to be part of a secret program that involved LCSS boats, Landing Craft Support Small, or as Yogi and his crew mates called it, “Landing Craft Suicide Squad.” They were on a 36-foot boat loaded with machine guns and rocket launchers, and it was their job to sit 300 yards off the coast of Normandy’s beaches and provide cover fire for the troops who went ashore. If you’ve read accounts of it in the past, Yogi sand it looked like it was the 4th of July, with all the bombs, rockets and machine gun fire blazing and lighting up the early morning skies. He had many more recollections which will be part of the D-Day feature we’re doing on him. But what strikes me about Yogi and many others who fought in World War II, is not that they sensed they were heroes or doing something beyond their call of duty, but that they BELIEVED IT WAS THEIR DUTY to enlist, to serve their country…they were, in their minds, just doing their jobs the way they were supposed to….to the best of their ability…as hard- working Americans…so incredibly humble. What’s remarkable to me is…that generation, which served so greatly, so often applied that same attitude towards their jobs when they came home. I use Yogi as an example of that…a hard worker, putting the team before onesself…Basically saying, it’s not about my individual success, but the success of the team…(Wow, how times have changed in that way in certain individuals, right? )…that attitude wound up earning Yogi many individual accolades, but the 10 World Series TEAM Championships is what he enjoys talking about. That and all his former teammates and their good times together. I once asked him if he had a sense of why people all love him so much, about why he’s considered such an icon and a legend…and in typical Yogi fashion, he just kind of shook his head and said something like, “I don’t know. People just like me, I guess.” I believe with regard to his incredible baseball career, like his service in World War II, he just felt like he was a guy taking his lunch bucket to work and doing his job the way he was supposed to. It didn’t matter that it was playing pro ball for the legendary New York Yankees. Now, did it MATTER to him that it was the Yankees? Absolutely! But he was, and is, in essence, a kid from the Hill in St.Louis working hard at his job to put food on the table for his family…he would have been great at anything he did in life, I’m sure (and he said if he wasn’t playing ball, he might be a shoemaker back home)…but, fortunately, all of us, young and old, got to see Yogi be great as a Yankee, and help take the team to unprecedented heights. Not bad for a shoemaker.